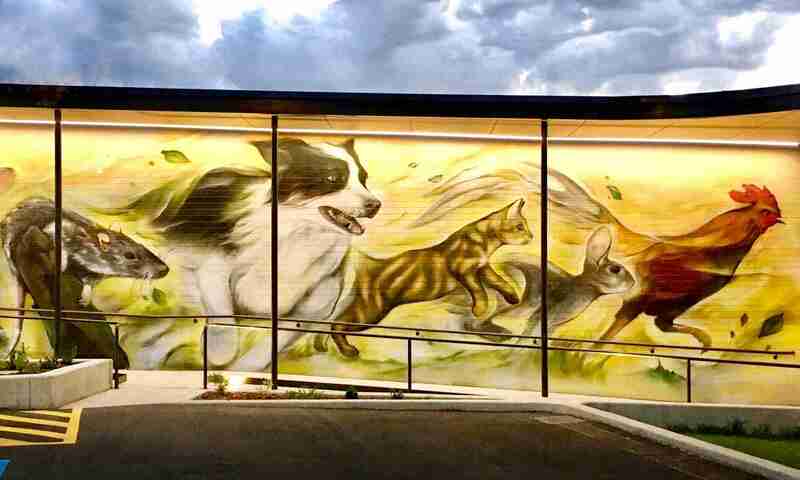 Have you seen those small dogs that hop or skip on a back leg? Most of these have a luxating patella. In our opinion far too few get it fixed. Andrew’s Loki was one. His surgery is a story for many dogs. Patellar luxation is dislocation of the kneecap. Dog knees are narrow versions of human ones, and the kneecap sits precariously on the front in a special groove. It only takes a small change to make it slip sideways. The most common cause of a luxating patella is poor alignment of the extensor apparatus. The picture at the start shows Loki’s leg during assessment before surgery. Can you see that the quadriceps muscle, the patella and the tibial crest are not in a straight line? When he was born they were straight, but as he grew the deformity developed. We don’t know why this happens, but it’s common in small & toy breeds plus Staffies and Bull Terriers. It’s unpredictable and there’s nothing you can do to stop it. Once the extensor apparatus is curved, the patella is pulled sideways when the quadriceps tightens. If the force is high enough the patella can pop over the edge of the trochlear groove and get locked on the other side. This is when the leg goes up. Sometimes it’s very painful. Repeated patellar luxation causes poor leg function. It is uncomfortable or painful and will eventually cause arthritis. Visit this page for other causes of hind leg problems. It also has a reliable surgical treatment. Grade 2: The patella can be luxated manually or bending the stifle causes luxation of the patella. The patella once luxated remains so until it is replaced manually. Grade 3: The patella remains luxated most of the time. It can be replaced in the groove manually but will reluxate when manual pressure is removed. Grade 4: The patella is luxated all the time and manual replacement of the patella within the groove is impossible even with the leg in full extension. Dogs with Grades 2 and 3 need the surgery discussed below. 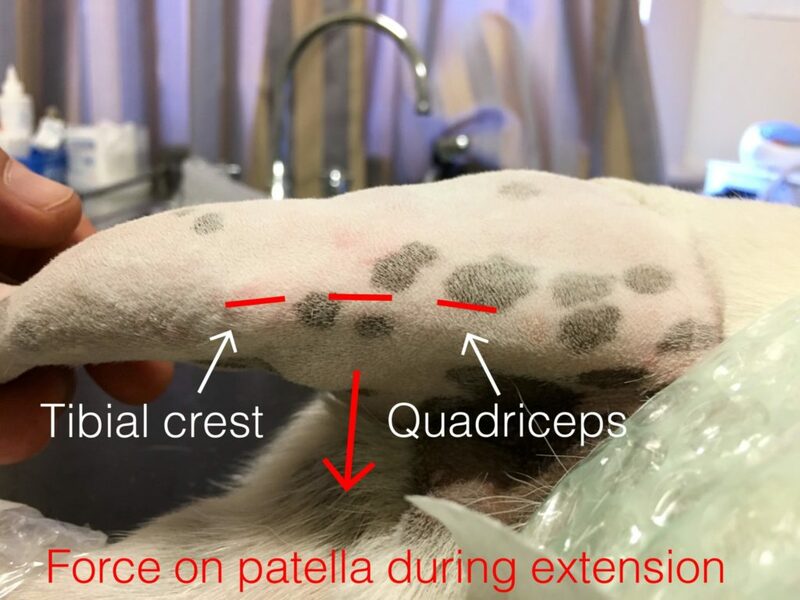 Some dogs with Grade 1 patellar luxation may not need surgery if the patella is causing them no trouble. 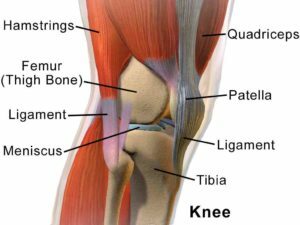 Grade 4 patellar luxation is best treated by an orthopaedic specialist. Your vet will give you an honest opinion after a physical inspection. How Do We Fix Luxating Patellas? There is a range of surgical procedures, and most dogs get at least two at the same time. TCT is the logical solution for most dogs; make the curve into a straight line. That’s done by elevating (cutting) the attachment of the patellar tendon from the tibia and moving it sideways until everything lines up. Now when the muscle contracts, the patella won’t get yanked sideways. The tibial crest is a small piece of bone that we reattach using a bent pin that stays in for life. Occasionally, after some months or years, some pins loosen and need removal but by this time the tibial crest has healed in its new position. The thick fascia (fibrous sheet of collagen) that supports the patella can be tightened on the opposite side from the luxation (usually the outside). This is either done by suturing the sheet in an overlapping pattern, or by removing a strip and stitching it back together. Further support can be gained by placing a suture from the side of the patella around an anchor point on the same side to prevent the patella shifting sideways. For this we use a special soft but strong braided suture material. Sometimes the groove the patella sits in is too shallow to stop the dislocation from occurring. This mostly happens when the dog has had patellar luxation that wasn’t fixed while still a growing puppy. Without pressure from the patella, the groove doesn’t form properly. A groove deepening procedure is avoided if possible due to the increased trauma required. Kneecap dislocation in a puppy requires immediate attention to prevent a poorly formed groove; at Walkerville Vet we usually perform a temporary procedure to replace the patella, and then wait until the pup is fully grown for the permanent solution. Careful walking after surgery is allowed! Recovery is usually fast and uncomplicated after these procedures. Dogs should be rested for four weeks (especially if large) but can still walk on a leash. 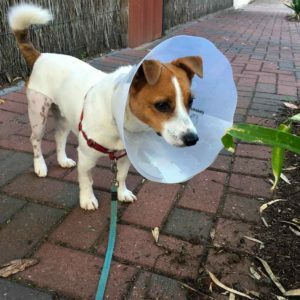 Follow the link for more details on recovery after surgery in dogs. So what did Loki have done? He had the first three procedures, but thankfully didn’t need his trochlear groove deepened.